Written by Adrienne Ehlert Bashista, illustrated by Christine Sykes. 32 pp. Color illus. ISBN 978-1933084008, published 2005. Based on the author’s family’s experience, this book describes a child’s life before and after she was adopted from Russia.From scenes in the orphanage to the child’s Russian birthmother, this is one of the first children’s picture books to chronicle the special background of children adopted from Russia.Delicate watercolor illustrations perfectly complement this poetic and heartfelt text, a celebration of the joy that adopting a child brings to a family. 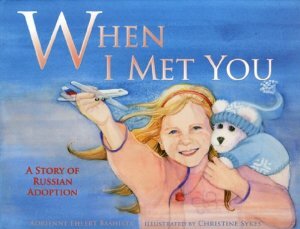 “The collaborative work of author Adrienne Bashista and illustrator Christine Sykes, When I Met You: A Story Of Russian Adoption is a picturebook based on Bashista’s own family experience in describing a little girl’s life before and after she was adopted from Russia by an American family. From scenes in the Russian orphanage to the birth mother, When I Met You is a unique chronicle of the special background of abandoned or orphaned children adopted from Russia. Syke’s 36 delicate watercolor artworks provides a superbly visual enhancement of a story that is as entertaining for young readers as it is informative and thoughtful. When I Met You is a welcome addition to school and community library picturebook collections, and especially recommended reading for children from families who are themselves adopted or who have adopted siblings.” ~Midwest Book Review.